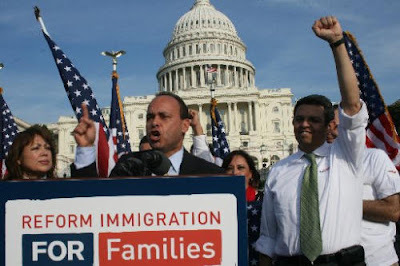 Gutierrez, 56, is the most passionate, tireless, and nettlesome voice in Congress on immigration matters. He's a constant presence at rallies and on TV, defending the undocumented and railing against xenophobia. It's no surprise that a recent Pew Hispanic Center survey ranked him the second-most-important Latino leader in the country, after Supreme Court Justice Sonia Sotomayor. "He's as close as the Latino community has to a Martin Luther King figure," says Frank Sharry, founder of the pro-immigrant group America's Voice. Yet Gutierrez's tactics are controversial. While many admire his tenacity and credit him with keeping immigration reform alive, others, including members of the Obama administration, believe his confrontational style can be counterproductive. He sees things more simply. "I have only one loyalty," he says, "and that's to the immigrant community." Says it all, doesn't it? 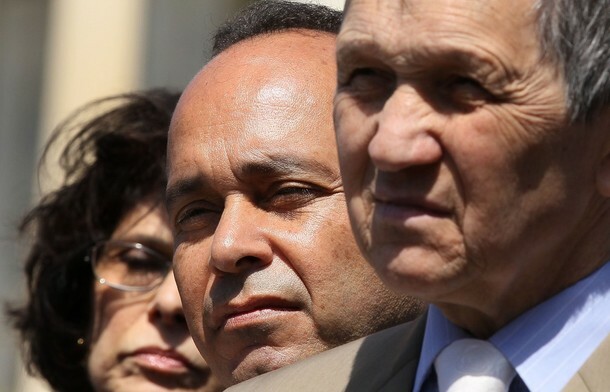 Gutierrez, according to the below Newsweek article, is the most prominent and influential Hispanic elected official in the country and a hero to many Hispanics. 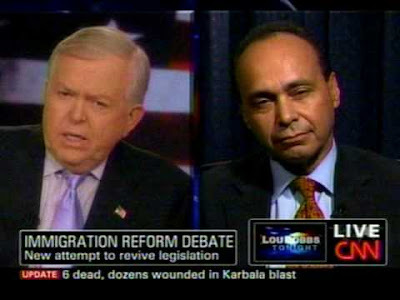 And this emblematic Hispanic proudly declares that his only loyalty is to the immigrant, i.e., the Hispanic, community. Since Gutierrez, to use Eric Voegelin's term, existentially represents Hispanics, and since Gutierrez states openly that he is only loyal to Hispanics, not to non-Hispanic Americans, and not to the United States, we can fairly say that Hispanics generally, or at least a very large number of them, have no loyalty to the United States. They are here as a self-consciously and explicitly different people, seeking to extract from America what goods they can, just as any invading people does to the people they are invading. They know what they're about. But we refuse to look. They are acting as a people. We refuse even to form a distant thought of ourselves as a people. They are seeking to gain power and other advantages for themselves at our expense. We, by our own choice and decision, don't even exist, let alone bother to defend ourselves. Such is the universal stance of white Western peoples today toward the nonwhite peoples whom they have invited into their midst. It is a posture leading to the extinction of the white world and everything it has created and everything it has been. We as a race and as a civilization will continue on that path, until we stop continuing on it. Gee, what a surprise. Refusing even to form a distant thought of ourselves as a people is seen by nonwhites, not as a progressive ideology, but as a weakness to be exploited. File under: human nature - known to all except emotion-neutered and brain-dead ideologues and their sheeple. Well whatdya know? Look at the face of hate that the anti-racism crusade produced. Call me crazy, but that face looks like the old-fashioned outgroup hatred that the anti-racism crusade was so bent on destroying. Ironic, isn't it?